Laser cut shaped easy 3D card kit. 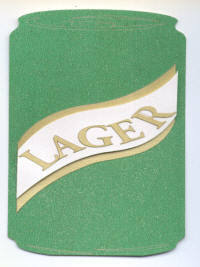 This kit includes the shaped lager can plus 2 layered label (marked for positioning) and cut out letters. Can cut from green pearlescent glitter card. Other pieces cut from pearlescent card. Complete with C6 white envelope.